Decide: Do I bring my cow to the machine or the machine to the cow? Our cows walk a path around our house to a walk-in basement. The basement is a concrete floor, insulated area that is not useable as human living quarters but is an excellent work area. We keep all our equipment in the basement, and therefore have no worries about frozen pulsators or a pump that won’t start! Many setups are outside in a barn environment. If this is so, and is your only option, then position your equipment in the most insulated area you can find, or create an insulated box to keep your pump in. A lamp with a light bulb can help keep the worst of frost off your pump, down to a point. We recommend always bringing your milking equipment inside, or at minimal, bring in your pulsator. I had many frustrating days trying to warm up a pulsator so it would work! You can also keep a spare pulsator (ebay.com has cheap pulsators you can buy for a spare) in case one gets moisture inside and freezes. In coldest weather, when our pump was in an outside area, we put insulation and a lightbulb near the pump to keep the pump from freezing – one little lightbulb made the difference! Teat dip also likes to freeze, so you can keep a “tool box” with your equipment that needs to head to a warm room between milkings. Consider purchasing a teat dip with emollients that are thick teat dips that will stick to the cow longer as a post dip and can help prevent frost. In below zero weather, you should consider using a cream or lotion and watch out for frostbite or wind-chapped teats. 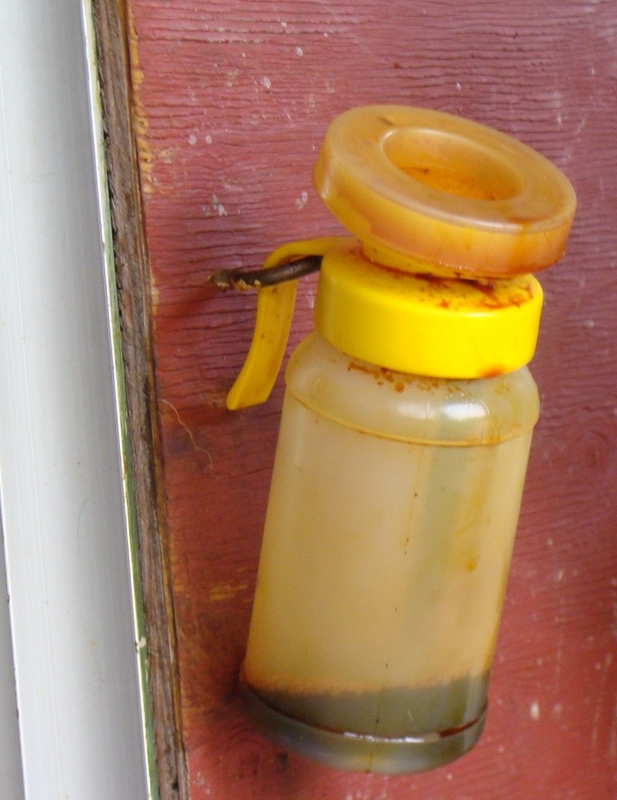 Homemade teat protection creams can be made from a combination of various oils. I like lanolin, beeswax, and a non-hardening oil like olive oil whipped together with tea tree oil. In either case, you should try to have soft bedding. A cow is several hundred pounds. She’s a lot bigger than a deer out in the wild, and she’s usually not as fat, like a pig or bear would be! So this means cushy bedding (ideally straw) combined with a basework bedding (we use shavings, but consider maybe sand or dirt with a tapered drainage rock edge). If your cow gets hairy udder syndrome in the winter… it is okay to trim her hair (you can use human clippers) or you can even just use scissors to trim the hair right around her teats so you don’t pull on her hair while trying to clean her teats or milk her. A good sign of proper cow is when a cow’s udder is clean the majority of the time. Every cow has an accident now and again, but in general, clean bedding should minimize the need for deep cleaning an udder in winter months. Milking cows need tempered water: Water heaters function to keep water around 40 degrees. When water goes below that temperature, cows significantly decline in water consumption. 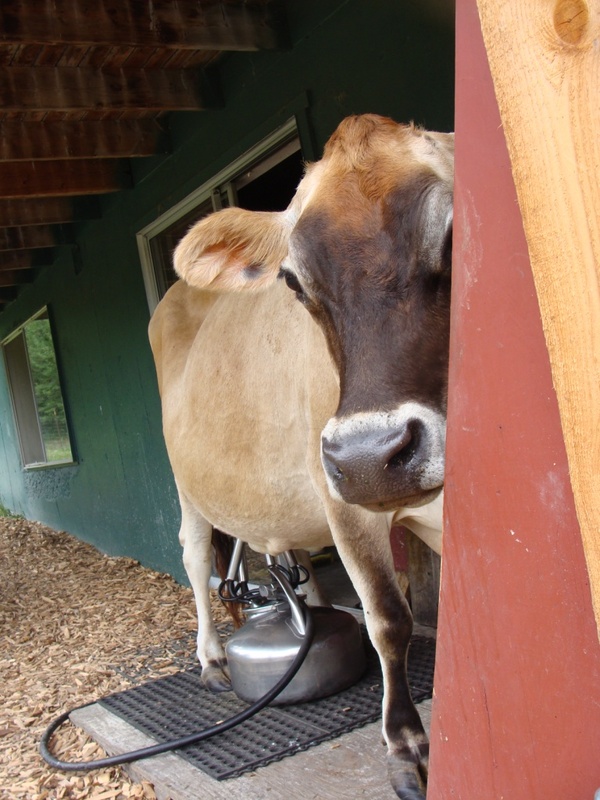 Considering the gallons and gallons of milk a cow produces daily, of which 85% is water… She needs access to ice-free water 24/7! Stocking up on hay in summer months (and all the associated HARD WORK!) pays big dividends come winter! Preparing in advance avoids metabolic stress from feed changes. If you’re able to feed the same variety of hay(s) all winter, the cow’s rumen is adapted to those hays. Any sudden changes may greatly affect her digestion, risking ketosis or diarrhea. A dairy cow requires LONG-STEMMED fiber as her primary diet. That means alfalfa cubes don’t cut it as a major feed source. One, they are much more expensive. Two, they are heavily processed and less likely to have the nutrition that a fresh hay would. Three, cubes/pellets are finely chopped so cows lose the benefit of the stem of alfalfa, which regulates how fast the hay goes through the cows’ system. Even if hay is twice as expensive as pellets, it’s worth the expense in quality. High quality hay cuts down on grain needs/costs. You might need to increase grain feeding if your cow early in her lactation in winter or thin and needs some extra energy to keep or put weight on. Don’t be afraid if your cow’s milk production goes down. While she may not milk what she does in summer time… she pays her way in cream! In general, fresh pasture grass = high production (meaning, more gallons of milk per day) & hay feeding = less % water, so more cream per gallon. A last tip: Any time you have a baby born in winter time, be sure to avoid wind. Drafts can cause calves to get sick very easily in cold weather. Ideal options are: a calf dome (a plastic individual calf pen) or a well-ventilated pen protected from wind with thickly bedded straw and shavings to keep the calf warm and dry. Ventilation can be above the height of the calf, so the calf is protected by side walls. A closeable door is nice to be able to open into a run/pen so that the calf can enjoy sunshiny days. DO YOU HAVE ANY MORE WINTERTIME TIPS OR ADVICE TO ADD? FEEL FREE TO COMMENT BELOW!